Jasminum polyanthum Family: Oleaceae (olive family) Common Names: winter jasmine, pink jasmine Description Fast growing twining vine with glossy, compound leaves and very fragrant white flowers in late winter and spring, preceded by delicate pink buds. Flowering is usually prolific, and growth is rampant. Vines reach a height of about 20'. Location Native to southeastern China. Pink jasmine is a popular landscape, house plant and greenhouse plant. Culture Light: Sun to part shade. Moisture: Average moisture. Hardiness: USDA Zones 8 - 11. 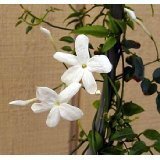 This jasmine is evergreen in frost-free climates. Can survive temperatures as low as 20 F. Propagation: By seed. Also by suckers. Usage In warmer climates, pink jasmine can be used freely to cover walls and high fences, to grow on arbors, or train up any surface where a verdant cover is desirable. This is especially nice grown around windows, where it can provide a visual frame and where its heavenly scent can waft inside. Makes a great house plant.